Travis was born in Anchorage, Alaska. Soon with his family moved to the Mat-Su Valley where he spent the first 25 years of life. In 2011 he decided to make some big changes in location (and his career) and made the long journey to Burke, VA. Growing up he was introduced to Massage Therapy early, his mother had begun practicing when he was just a baby but did not practice long. Hearing her speak of her schooling and the way she was able to help people sparked his interest in massage initially. His stepfather was a coach for American Legion baseball, this brought the learning of Sports Therapy as well as Sports Recovery Training to his attention. 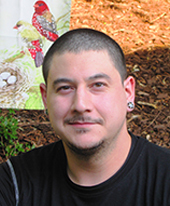 Moving to Burke, VA he started down the path to his career as a Massage Therapist in 2012 at the Northern Virginia School of Therapeutic Massage in Falls Church, VA. While through school he was given a good core knowledge of Therapeutic Massage (Swedish as well as Deep-Tissue), he has tried his best to expand his knowledge, learning techniques such as Myofascial Release & Sports Recovery to name a few. Armed with his passion, skills, and the support of his family and friends he now offers the best of care to his clients around the Northern Virginia area, from helping the struggling over worked to find some peace and relaxation, to helping athletes recover from intense training.